Hey Love: With A Bow On Top! With A Bow On Top! Hola lovelies! Hope y'all had a good weekend! I spent mine relaxing and getting sucked into my Kindle. Those things are dangerous to my health! Hahah Having all those books at my fingertips is not a good thing. Seriously, I finished a book last night at 3:30 and almost started the next book in the series. Had to make myself stopppp! Such a nerd! Does that ever happen to y'all? I'm gonna need you to send me this outfit. All of it. Because I love every single piece. You look fantastic. ohh dear! !really so pretty!in love with your look!! This outfit is so classy and fun. I love it on you! Maybe one of my favorite outfits of yours. Lovely skirt!! I'm looking for one exactly like this...Is it from the new season?? You look so classy and chic!! adorable stripes here and a lovely top. also like the pop of red from the bag! This is just too cute! Love the skirt and the bow is just adorable. So cute! You look so pretty! One of my favorite looks for sure. thanks for your comment. lovin the outfit!! your outfit is adorable! love the bow! You look gorgeous - I love everything about this outfit! Pretty outfit. Yeah if the book is awesome it happens. Would did you read? this is such a chic look! the bow detail definitely compliments the combination of colors and patterns! That skirt is gorgeous! You paired it so well with that bow top, the red bag and lips! Man, everyone is hitting outta the park in skirts today! Love it!! That top is gorgeous too. You look GREAT! LOVING THE BLACK WHITE AND RED COMBO! Oh my goodness this whole look is stellar!! You are gorgeous ma dear. Love this look!! The shirt is to die for. I have this thing for bows!! Gorgeous! Great skirt! You and I have twinsies posts as we both have black and white stripes as our theme! Loving the stacked gold jewelery. And, that skirt is darling; I'm a sucker for anything nautical-ish. love that blouse! so cute for summer! I love this outfit! It's so beautiful and classic. The shape of that skirt is fantastic. This is such an adorable outfit. Quite a nice classy touch to the classic nautical look. Can't say I've ever stayed up until 3 with a book though- I'm not much of a reader...except for blogs! OMG. Could that outfit be any cuter?! LOVE the bow! And the stripes obviously. Great coordinating! Hope you have a great week, Giovanna! Such a chic, great outfit! And the red lipstick looks great on you! I love everything about this look :) And reading can be dangerous! this is so cute! loving the accessories especially. What an amazing outfit!! Ah looks wonderful! 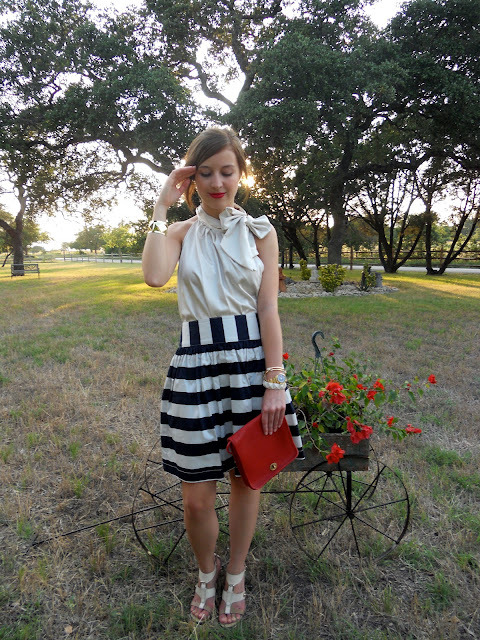 What a gorgeous blouse - love it with that striped skirt! Love that skirt! Super cute! Such a great top! Can't wait to see you pair it with other items. So classy chic. Yes, that happens to me ALL the time. Absolutely love this outfit (and the red lipstick!). So Glam! You look great. what I lovely blog you have!!! Great outfits! !